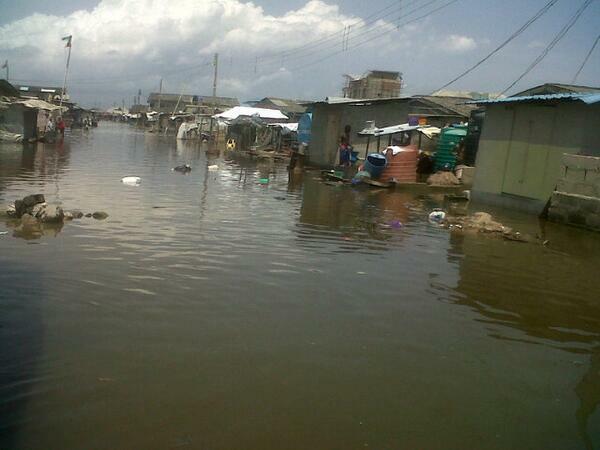 The Atlantic Ocean overflowed its banks at the Alpha Beach area today leaving residents of Lekki in a state of panic. Reports say the flooding was aggravated due to the absence of proper drainage in the area around Ocean View Estate which suffered much of the flooding. Residents who are very bitter about the situation of their environment complain that the disaster is becoming a yearly occurrence with no hope of respite. An SL ireporter who even tried to take pictures was almost mobbed by angry residents who say different people have come over the years to take pictures promising that the government will look into the situation, but nothing has been done. People living around Okun Alfa area of Lekki have their houses submerged in water with properties worth millions of naira destroyed due to the flooding. More important is the health implications of the flooding with residents fearing a full blown epidemic.